Date/Time: Reformatting dates imported as integer numbers? Hi. 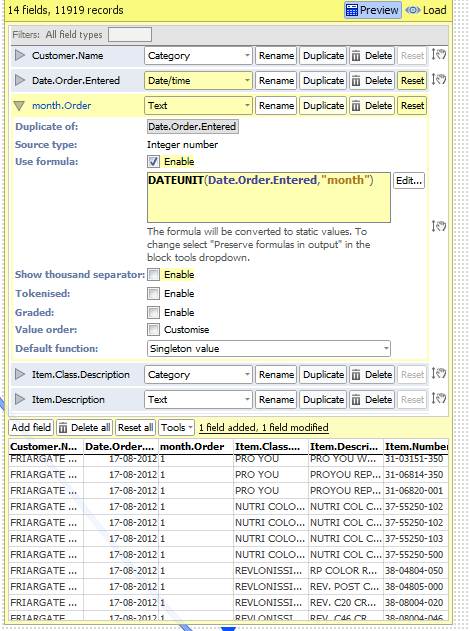 I have a date field which converts correctly from Excel and can be seen in the attached picture. I then wanted to create another field to store the month. The formulae looks correct but the result is the same for every record rather than changing. Again see picture. Any ideas? Also how would I get it to display the month name rather than a number, once the issue is corrected? Did you try duplicating the date field and making the date format output "MMM"
Graham - This is not a bug, but rather a confusing aspect of duplicating fields in Omniscope Field Organiser blocks. Your external source data is an integer number meant to stand for a date: 20120313. Using a Field Organiser, you told Omniscope to read this integer number in as a Date/Time field using yyyyMMdd and saving/displaying the result as dd-MM-yyyy. You then duplicated this field so you could re-type as Text/Category in order to have more filtering and visualisation options. Unfortunately, the duplicate field is still referencing the original field's source data integer number. 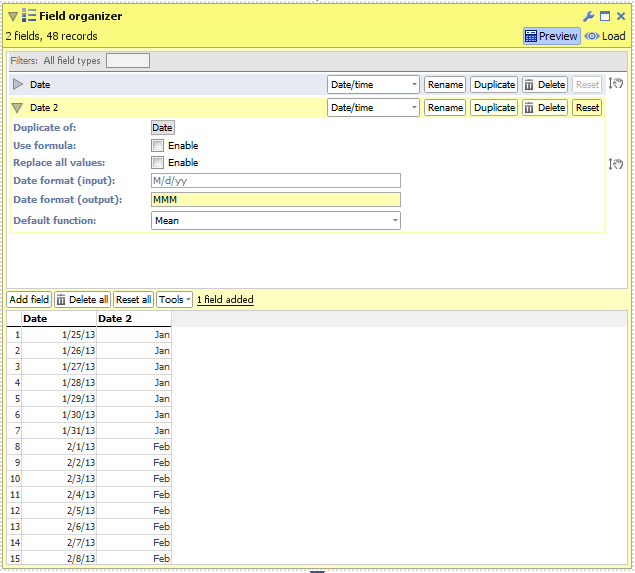 I took the file you provided and manipulated the fields using a field organizer. File attached. I see. Thanks. I had yyyymmdd which does not work. Changing to yyyyMMdd does work. I did not realise the formats are case sensitive. Should they be? BTW - can you do parato charts anywhere in the system?